FAYETTEVILLE, Ark. – Crystal Bridges Museum of American Art in Bentonville received international attention even before it opened last November, but it is only the most recent example of Alice Walton’s influence and impact on the people in her home state. To recognize her lifetime of contributions Ms. Walton will receive an honorary Doctor of Arts and Humane Letters from the University of Arkansas during the spring All-University commencement ceremony Saturday, May 12. Alice Walton is the youngest child of Helen and Sam Walton. She grew up in Bentonville, where her father operated the local five-and-ten store before starting his own company, Wal-Mart, in 1962. She attended Trinity University in San Antonio, where she earned a bachelor’s degree in economics and finance. She began her business career with the First Commerce Corp. and later served as head of all investment-related activities at the Arvest Bank Group. In 1988, she founded the investment bank Llama Company, serving as president, chairman and chief executive officer. Walton helped bring Northwest Arkansas business and political leaders together in 1990 to form the Northwest Arkansas Council, and was the first chair of this community development organization. The council played a major role in creating the Northwest Arkansas Regional Airport, which continues to play a pivotal economic role for the area, helping to spur more than a decade of unprecedented growth. Walton helped finance the project and provided the initial seed capital to fund construction of the airport. The Alice L. Walton Terminal Building was named after her to recognize her contribution and support. Walton has also played a guiding role in the Walton Family Foundation, one of the nation’s foremost philanthropic organizations. The foundation has made significant donations to the University of Arkansas, transforming the Sam M. Walton College of Business, creating the Honors College and endowing the Graduate School, turning each into nationally prominent and competitive institutions. She has continued to take an active interest in the university, serving on the Board of Advisors for the Graduate School of Business. The Walton Family Foundation also helped fulfill Walton’s vision for Camp War Eagle, which since 2006 has given summer camp experiences to thousands of children from different socio-economic backgrounds, most of them attending free of charge. Crystal Bridges realizes Walton’s dream of creating an enduring cultural gift for the people of her family’s home region and state. Walton drew on her lifetime love of art, her own considerable private art collection, her resources and those of the foundation to create what the New York Times called “the first major institution in 50 years dedicated to the vast spectrum of American art.” In doing this she has earned the respect of the arts community worldwide while making Northwest Arkansas a travel destination for tens of thousands of people, in and out of the state. At the same time, her gift is transforming the way many people think about Arkansas. 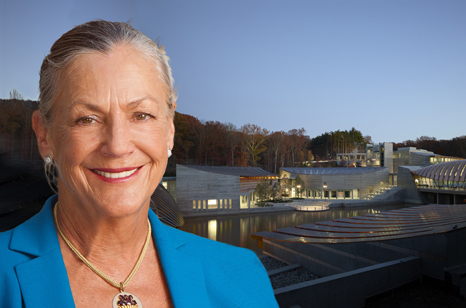 More information about Alice Walton and Crystal Bridges Museum of American Art is available at http://www.alicewalton.org.